Fans of Star Trek TM were thrilled in 1987 to welcome the launch of a new series expanding the Trek universe: Star Trek: The Next Generation. 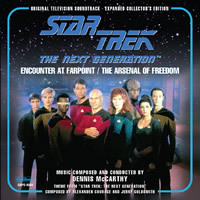 Soon after, GNP Crescendo Records was equally excited to release Dennis McCarthy’s score for the opening two-hour pilot episode, “Encounter at Farpoint.” Now, GNP Crescendo is releasing an Expanded Collector’s Edition of that same pioneering score, including even more of McCarthy’s dramatic music, newly mixed and mastered from the original multi-track elements under the supervision of the composer. McCarthy—who has written more music for the franchise than any other composer—wrote over 40 minutes of brash and colorful music for “Encounter at Farpoint,” establishing the bright, dynamic style he would maintain throughout the show’s first season. He made frequent use of Alexander Courage’s iconic Star Trek fanfare, as well as a new, heroic theme for the captain of the U.S.S. Enterprise, Jean-Luc Picard. Typical of early Next Generation scores, the music manifests a post-Star Wars sound, symphonic and often reflective of the hammering rhythms and surging chords of Holst’s “Mars, the Bringer of War” from The Planets in its treatment of action and space battles. As a bonus, this new CD also includes the world premiere release of McCarthy’s score to “The Arsenal of Freedom,” an action-packed episode from late in the first season. 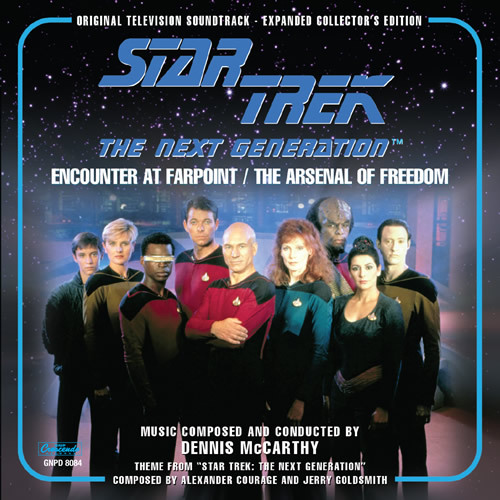 The CD concludes with several bonus and alternate cues from “Encounter at Farpoint”—including McCarthy’s unused main title theme (which was replaced with Jerry Goldsmith’s theme from Star Trek: The Motion Picture for the series). This latest release in GNP Crescendo’s continuing commitment to preserving the musical legacy of Star Trek includes a 16-page booklet with informative notes by Jeff Bond, author of The Music of Star Trek—incorporating comments from the composer.